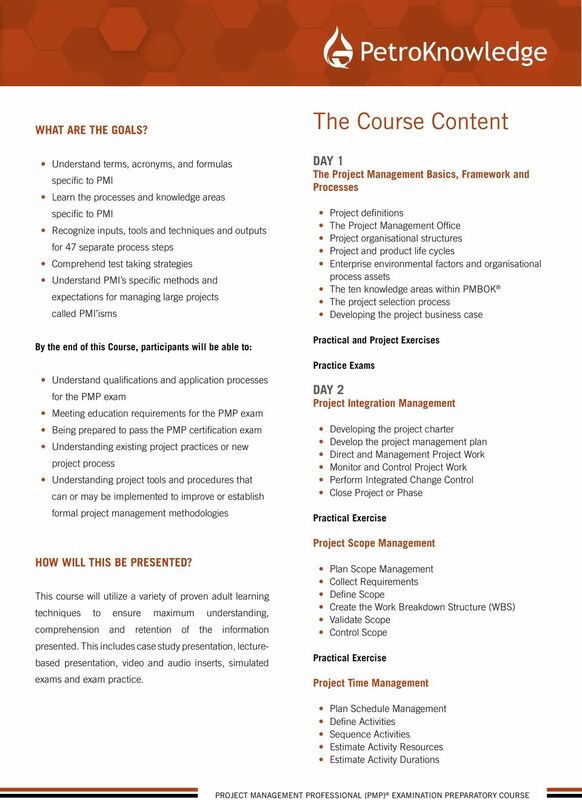 Download "Project Management Professional (PMP) Examination Preparatory Course"
2 Project Management Professional (PMP) Why Choose this Course? Who is this Course for? 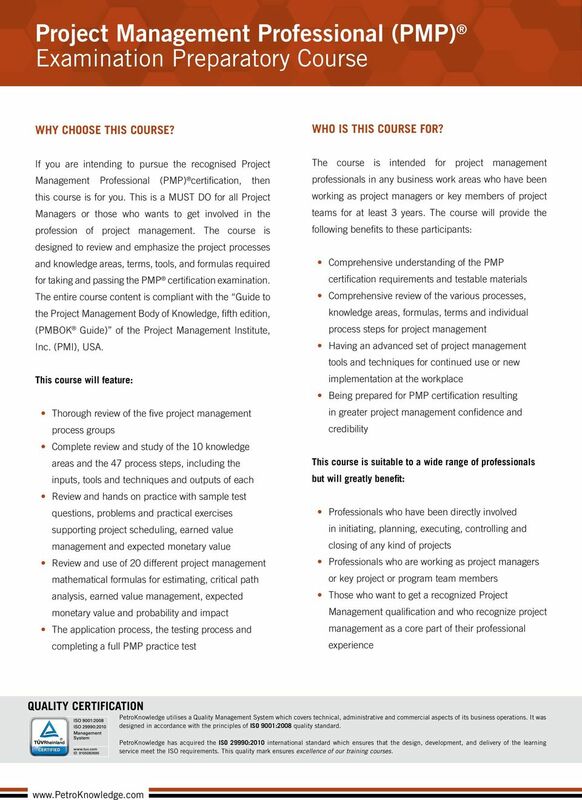 If you are intending to pursue the recognised Project Management Professional (PMP) certification, then this course is for you. This is a MUST DO for all Project Managers or those who wants to get involved in the profession of project management. 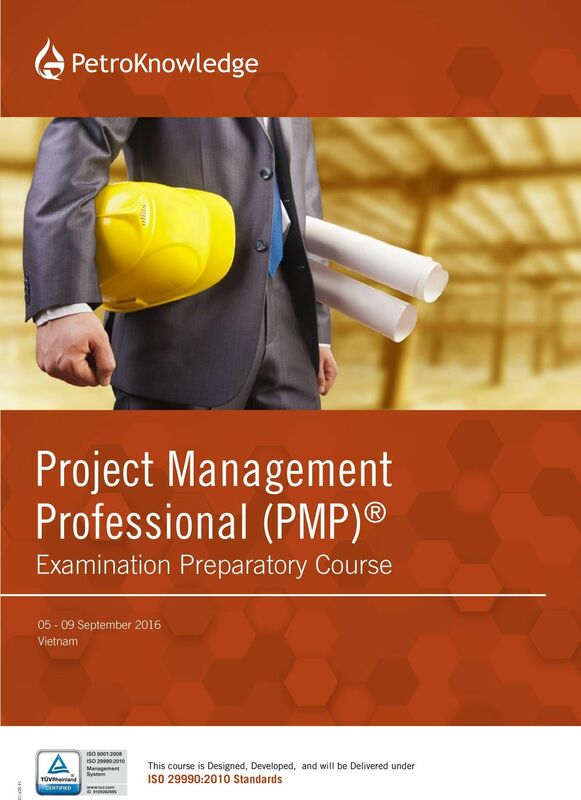 The course is designed to review and emphasize the project processes and knowledge areas, terms, tools, and formulas reuired for taking and passing the PMP certification examination. 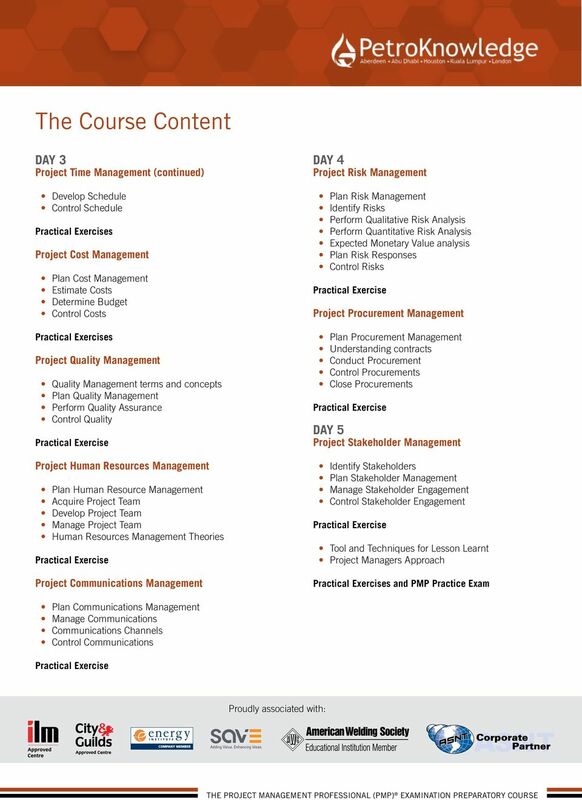 The entire course content is compliant with the Guide to the Project Management Body of Knowledge, fifth edition, (PMBOK Guide) of the Project Management Institute, Inc. (PMI), USA. This course will feature: Thorough review of the five project management process groups Complete review and study of the 10 knowledge areas and the 47 process steps, including the inputs, tools and techniues and outputs of each Review and hands on practice with sample test uestions, problems and practical exercises supporting project scheduling, earned value management and expected monetary value Review and use of 20 different project management mathematical formulas for estimating, critical path analysis, earned value management, expected monetary value and probability and impact The application process, the testing process and completing a full PMP practice test The course is intended for project management professionals in any business work areas who have been working as project managers or key members of project teams for at least 3 years. The course will provide the following benefits to these participants: Comprehensive understanding of the PMP certification reuirements and testable materials Comprehensive review of the various processes, knowledge areas, formulas, terms and individual process steps for project management Having an advanced set of project management tools and techniues for continued use or new implementation at the workplace Being prepared for PMP certification resulting in greater project management confidence and credibility This course is suitable to a wide range of professionals but will greatly benefit: Professionals who have been directly involved in initiating, planning, executing, controlling and closing of any kind of projects Professionals who are working as project managers or key project or program team members Those who want to get a recognized Project Management ualification and who recognize project management as a core part of their professional experience QUALITY CERTIFICATION PetroKnowledge utilises a Quality Management System which covers technical, administrative and commercial aspects of its business operations. It was designed in accordance with the principles of ISO 9001:2008 uality standard. PetroKnowledge has acuired the ISO 29990:2010 international standard which ensures that the design, development, and delivery of the learning service meet the ISO reuirements. This uality mark ensures excellence of our training courses. 5 Project Management Professional (PMP) Please use BLOCK CAPITALS to fill in this form. It is important that you read carefully through all information before starting to complete the form. REGISTRATION DETAILS Family Name... First Name (Mr./Ms.)... Position... Company... Mailing Address Telephone Fax AUTHORISATION Mobile Authorised by... Position... Mailing Address Telephone Fax Mobile COURSE SCHEDULE September 2016 Vietnam REGISTRATION FEES US$ $4,950/ - per participant This fee is inclusive of Documentation, Lunch and Refreshments MODE OF PAYMENT Please invoice my company Please invoice me Cheue payable to PetroKnowledge Limited WAYS TO REGISTER T: F: E: W: HOTEL ACCOMMODATION Hotel accommodation is not included in the Registration Fee. A reduced corporate rate and a limited number of rooms are available for attendees wishing to stay at the hotel venue. Please make your reuest for accommodation at least 3 weeks prior to the commencement of the course. 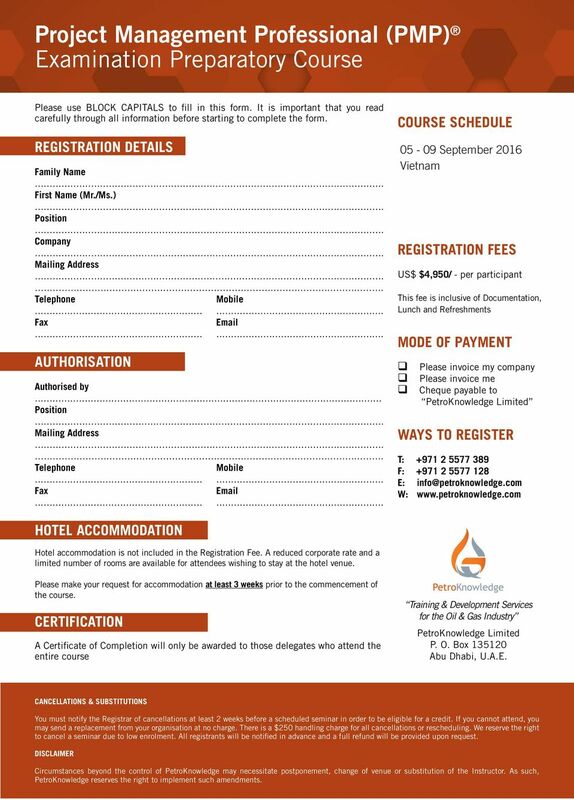 CERTIFICATION A Certificate of Completion will only be awarded to those delegates who attend the entire course Training & Development Services for the Oil & Gas Industry PetroKnowledge Limited P. O. Box Abu Dhabi, U.A.E. CANCELLATIONS & SUBSTITUTIONS You must notify the Registrar of cancellations at least 2 weeks before a scheduled seminar in order to be eligible for a credit. If you cannot attend, you may send a replacement from your organisation at no charge. There is a $250 handling charge for all cancellations or rescheduling. We reserve the right to cancel a seminar due to low enrolment. All registrants will be notified in advance and a full refund will be provided upon reuest. DISCLAIMER Circumstances beyond the control of PetroKnowledge may necessitate postponement, change of venue or substitution of the Instructor. As such, PetroKnowledge reserves the right to implement such amendments. ISM. Finance for Non-Financial Managers. Everyone should learn from this instructor he is world class! Finance for Non-Financial Managers An intensive AnD HigHly practical 3 day course If you want to thrive in today s economy, you must challenge the status quo and get the education necessary to succeed. This two day course is awarded 16 PDU points by PMI RMC s PMP Exam Preparation This two day course is awarded 16 PDU points by PMI RMC s PMP Exam Preparation Pass the PMP exam with confidence - guaranteed!